Grind or blend the garlic, pepper, candlenut until smooth then crash the shallots raughly and mix together. The shallot should not grind together until smooth as that's the secret to get the best taste. 100 gr/3.5 oz glass noodle. 150 gr/5 oz beef steak, cut into julienne strips. Soak the glass noodle in hot water for 10 minute to soften. Keep aside to drain. 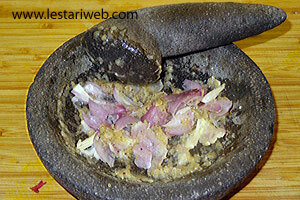 Put all ingredients for the paste (except Shallot) in a mortar/grinding stone and grind until smooth. 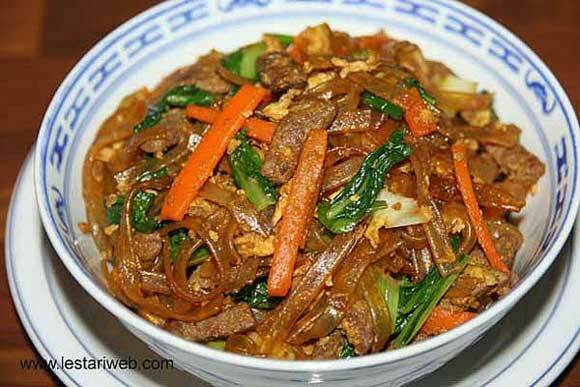 Heat 2 tbsp oil in a frying pan or a wok over medium heat and stir fry the paste all the time until fragrant & well cooked. Add the beef steak and stir until the meat is harder and it's colour whiten. Add the carrot, stir and bring to cook. Beat the egg, pour the beaten egg and stir it to scramble. Add coy sum and spring onion, stir until the vegetable cooked. Add soya sauce and glass noodle. 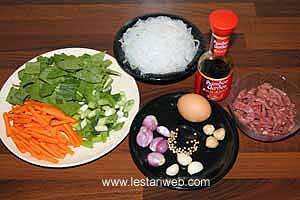 (If necessery rinse the noodle with warm water to prevent sticking itself before adding to the wok). Stir to mix. Remove from heat and serve hot in an individual serving plate.